Halloween: Resurrection may be considered the worst of the HalloweeN films, but that notoriety hasn’t stopped some of us from being drawn to a few aspects of it. There are people who appreciate the Michael Myers Mask in Resurrection. There are others who like Brad Loree’s performance as Michael Myers. Some are fond of the opening with Jamie Lee Curtis. 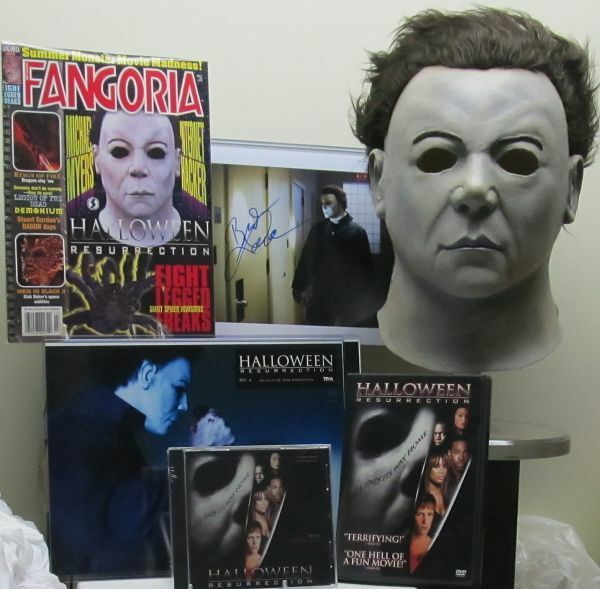 Here are some random items related to Halloween: Resurrection. The Michael Myers mask is the Brad Loree Signature Series by SSN (find a review of the mask here). 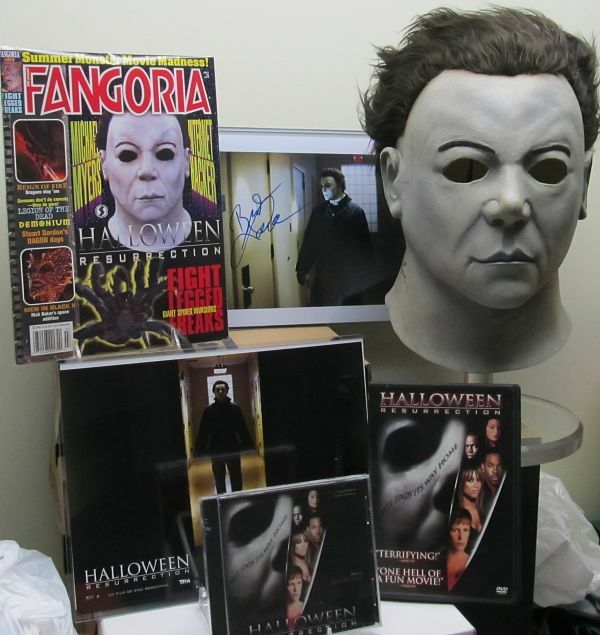 To the left of the mask is a photo autographed by Brad Loree, who played Michael Myers in Resurrection. Farther to the left is Fangoria Magazine, Issue #214. The feature article is, of course, on Halloween: Resurrection. The magazine report hints that Busta Rhymes may have been difficult to work with on set. It also conveys that Brad Loree was a cool guy, signing autographs for onlookers during filming. The bottom row of items are, from left to right: Resurrection lobby card, Halloween: Resurrection Soundtrack CD, and the DVD for the film. The lobby card is taken from a larger set. The image is crisp and clean. The music on the CD is by Danny Lux. Resurrection‘s score is rather echoey, so I don’t find myself listening to it very much. I missed Halloween: Resurrection in theaters, so the DVD holds some sort of small significance to me. I remember watching it for the first time on DVD and also enjoying the many special features (and noticing scenes in the “Head Cam Featurette” that were not in the movie’s theatrical cut). I really Enjoyed the awesome and amazing costume worn by brad loree in the film. the story was quite out of hand but I have to say brad loree did a tremendous job in the film. such a amazing guy and hes awesome! Brad Loree loves the fans, and he knows that getting to play Michael Myers is something special. The film would have been way better if Busta Rhymes was not present. At least H20’s rapper LL Cool J wasn’t nearly as annoying. Also the resurrection theme was a great cover, darker than the original, but also truer to it in it’s minimalism. For the most part it’s plain and simple piano notes; less orchestration, no electric guitar, nor obnoxiously loud sound effects. I thought HR was an ok movie.Halloween 1 and 2 are classics, does not compare to those two movies obv.They need to bring Carpenter back for the new Halloween 3 movie.